David Sandberg burst onto the scene with the critically acclaimed short film Lights Out starring his wife, Lotta Losten. The short was so effective it left viewers with the desire to sleep with the lights on. The short was a viral hit and has spawned a feature film directed by first-time helmer Sandberg and produced by Lawrence Grey and James Wan. 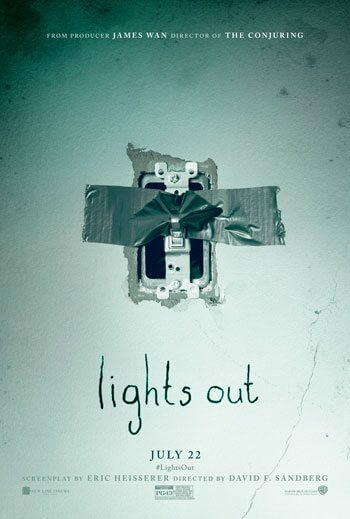 Warner Bros Pictures will launch Lights Out in theaters on July 22, 2016, putting the horror film up against big budget summer releases. Lights Out was one of the upcoming releases Warner Bros spotlighted during its 2016 CinemaCon presentation in Las Vegas and following the studio’s screening of the film’s trailer – which was met by enthusiastic applause – I had the opportunity to interview producer Lawrence Grey to find out more about the horror film starring Teresa Palmer and Maria Bello. The Plot: When Rebecca (Palmer) left home, she thought she left her childhood fears behind. Growing up, she was never really sure of what was and wasn’t real when the lights went out…and now her little brother, Martin (Gabriel Bateman), is experiencing the same unexplained and terrifying events that had once tested her sanity and threatened her safety. A frightening entity with a mysterious attachment to their mother, Sophie (Bello), has reemerged. But this time, as Rebecca gets closer to unlocking the truth, there is no denying that all their lives are in danger… once the lights go out. The trailer is ridiculously scary. Why did you believe David Sandberg could direct a feature film based on his short film? Lawrence Grey: “I saw the short before it blew up to the 150 million views. It was really early and it had just kind of debuted on Reddit and was starting to get some traction. The brand of my company is very commercial movies done in an interesting, artistic way. That was exactly how that short hit me. It’s this big genius universal idea. We all know it. We’re all afraid of the dark. We all know that feeling of, ‘I saw that thing out of the corner of my eye. Is that a tree? Is that my laundry? Or is it something more sinister than that?’ There was real craft to how he did it. You decided to keep the monster from being seen right away, so how do you keep the audience involved when they don’t see what’s really going on? Obviously there are some moviegoers who really like to see the monster right away and others who don’t want it fed to them so quickly. How did you know when was the perfect time to show what the monster actually looks like? Your production company has done a psychological thriller but not a straight-out horror film. Why did you decide to delve into the genre with Lights Out? Lawrence Grey: “It’s never been done. I didn’t think so. Why has it taken so long to do that story? How big was the budget on Lights Out, if you don’t mind saying a ballpark figure? How does that feel as a producer to have your film released among the summer’s big tentpoles? You’ve got a terrific cast led by Teresa Palmer and Maria Bello. Can you talk about having them o board? It really gives the film some weight. Even if you didn’t know the short or anything else about it, you’d see those two names and be intrigued. How closely did you work with James Wan? With a $5 million budget, was it all practical effects? Lawrence Grey: “This was one of the big decisions early on. We’re all lovers of authentic horror films. You’re seeing a lot today of things done with a lot of CG. It just feels false to us. Even though it was a much riskier, more herculean task to do it, we all decided to keep the movie completely practical from a monster standpoint. Remember, our director, his background is visual effects, and he’s saying this. Did it scare you when you saw the actress in the suit on the set? And this is going to launch a franchise? There’s more story to be told, isn’t there?